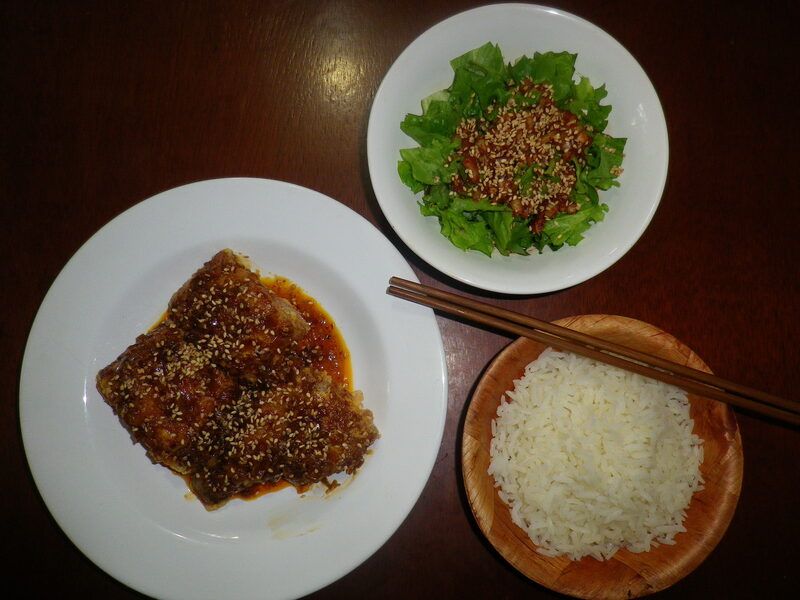 Today I’m going to share my delicious seasoned flatfish recipe using fluke. 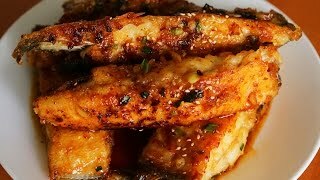 It’s crispy fried fish coated in a delicious, sweet, salty, garlicky sauce. I use fluke in my recipe, but you could use any type of flatfish. And I cleaned mine but you can ask your fishmonger to clean it for you, and even cut it into pieces for you. I know some people will be a little uncomfortable with the idea of cooking with so many fish bones in, but that’s the way Koreans enjoy it. I can’t imagine making this dish with fish filets. As Koreans say, it would be like a helicopter without a propeller. Something critical is missing! Enjoy the recipe, and if you make it, let me know how it turns out! Cut the fish into several pieces crosswise. Wash and drain and put them in a bowl. Sprinkle each piece evenly with the salt and refrigerate for at least for 30 minutes, or overnight. Coat each piece with the potato starch powder. Heat up a large pan and add a generous amount of cooking oil. Put the fish in the pan and lower the heat to medium. Let cook for 5 to 7 minutes until the bottoms get crunchy and light golden brown. Then flip them over. Turn down the heat to low. Cover and let cook for about 10 minutes. You’ll see the sides of the fish pieces look opaque, which means they’re cooked thoroughly. Flip over the fish once more. Turn the heat up to medium high to make the fish nice and crunchy and golden brown. Take the fish off the pan and turn off the heat. Heat up a large skillet with 2 tablespoons vegetable oil. Stir-fry the garlic for a minute until it’s light golden brown and crispy. Lower the heat to medium. Add soy sauce, ¼ cup water, rice syrup, and hot pepper flakes. Keep stirring until the sauce is bubbling. Add green onion, stirring for 30 seconds before turning off the heat. Take a piece of the cooked fish and dip in the sauce to coat. Transfer it to a serving plate. Repeat it with the rest of the pieces. Sprinkle with sesame seeds and serve as a side dish for rice. Leftovers can keep in the fridge up to a week, eat them cold or reheat in the microwave or on the stove with a few drops of water. Posted on Sunday, November 6th, 2016 at 8:28 pm. Last updated on November 7, 2016. Posted March 24th, 2019 at 7:16 pm | Log in to reply. Here in Ecuador, in the Andes region, Tilapia is a very popular and tasty fish, and I always have some stored in the freezer. Today I had two Tilapias unfrozen, and prepared them yangnyeom-twigim-style. They turned out so tasty, had a mouthwatering sunday lunch. 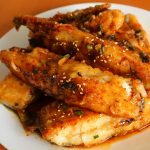 Guess, you can use the yangnyeom-twigim sauce on any kind of fish. Posted February 5th, 2018 at 11:38 am | Log in to reply. I made Gajami yangnyeom-twigim for lunch yesterday. Only couldn´t get flatfish in town, so I got a pound of frozen seabream fillets at the supermarket. But anyway, it´s the sauce that makes it! The fish got so crunchy and tasty! Gonna enjoy a leftover for lunch today. Deliciousss! Made some Sangchu-geotjeori as a side dish. Just prepared a double portion of the dressing, and keep it in an empty salad dressing bottle in the fridge. Added one teaspoon of minced ginger to the recipe, though: made it perfect. Posted February 17th, 2018 at 1:45 pm | Log in to reply. Wow both sidedishes look mouthwatering! Posted February 17th, 2018 at 3:40 pm | Log in to reply. Thank you for the compliment! Thanks to your excellent webside with your mouthwatering recipes! And the videos are a great help, make Korean cooking sooo easy! Posted November 16th, 2016 at 5:21 pm | Log in to reply. Is it okay to remove the fish skin? I’m not a fan of fish skin. Posted November 9th, 2016 at 9:41 am | Log in to reply. I’m a great fan of the show! This new dish looks delicious. That is way i’m making it tonight! I’m using slip sole. Posted November 8th, 2016 at 5:03 am | Log in to reply. That fish fry looks so tasty that my dog is trying to eat it off the screen of my iPhone. I got galchi already salted in my freezer that I just got this morning. Will try this recipe with those galchi and post it on my instagram and tag you. My son is such a picky eater but I got the feeling he’ll like this recipe. This recipe was originally posted on November 6, 2016 at 8:28 pm by Maangchi. It was last updated on November 7, 2016. The video was watched 560,392 times on YouTube & has 11,881 likes!